After a long day at the Happiest Place on Earth, all anybody wants is a comfy and clean home-away-from-home that’s perfect for the entire family. At HoJo Anaheim, we understand this on a deep level. 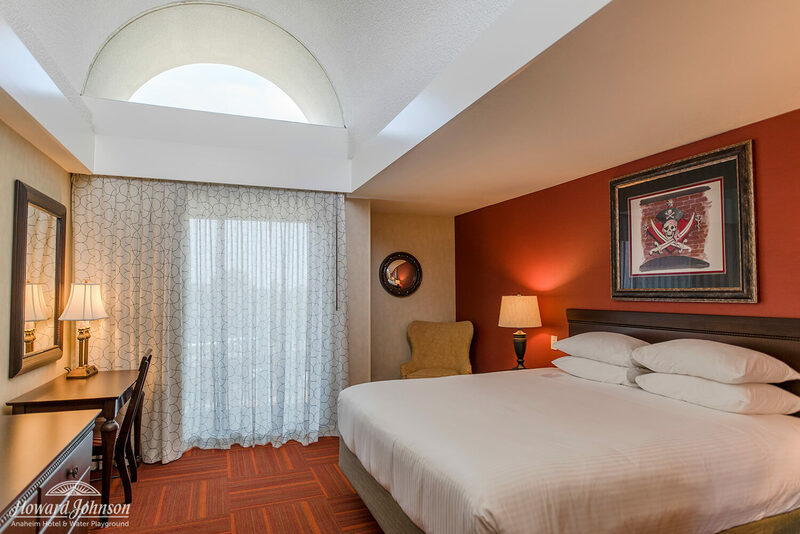 From our lush Dreamscape pillow-top mattresses, to our spacious room square footage; we want all of our guests to be as comfortable as possible! This is especially true for every family that stays with us — no matter how big or small, we want the whole gang to have all the space they need. That’s why we have a variety of suite and room bundle options to make sure your family gets the perfect room for their magical Southern California vacation! Looking for a getaway that’s perfect for you and your little ones? Avast ye — we’ve got you covered with our pirate-themed Kids Suite that will get every buccaneer in the family geared up for a swashbuckling day in the parks! 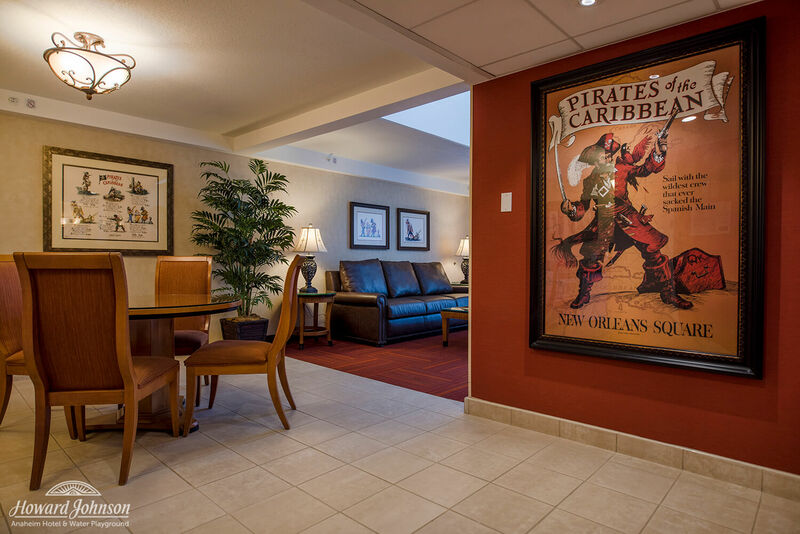 Located in Building 1, vintage Pirates of the Caribbean artwork delights throughout this spacious two-room, 538 square foot suite! 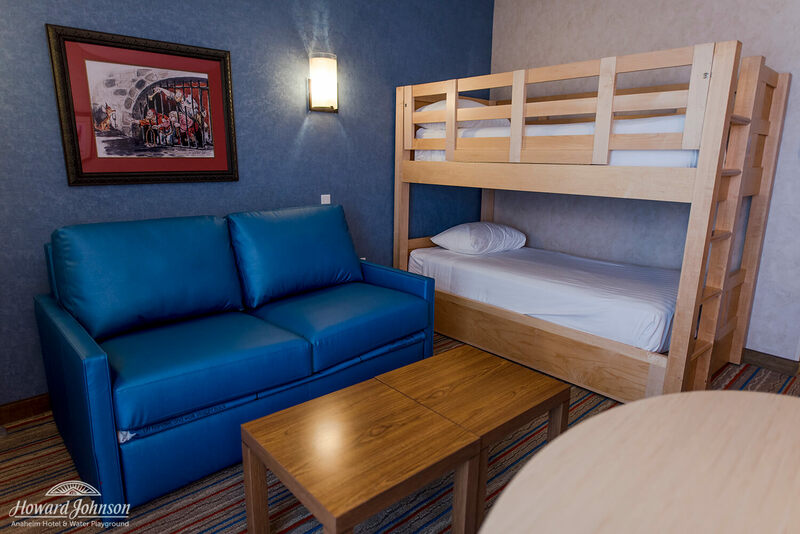 Twin bunk beds and a deluxe double sleeper sofa in one room and a king bed for the parents in the other room give the entire family space to relax after a long day in the parks. 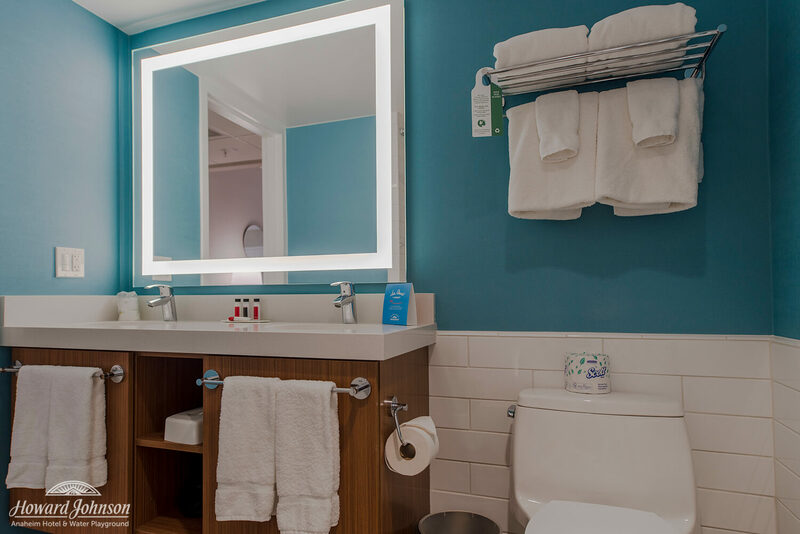 And perhaps the best feature of all, our spacious Kids Suite features two bathrooms so everybody in the family can get ready for a big day in the parks with ease! If you need extra space but a Kids Suite isn’t quite the right fit for your family, our Two Queen/Two-Room Bundle may be just what you’re looking for! Designed for families that need the space of two rooms but don’t want to be split up, our Two Queen/Two Room Bundles feature two rooms connected with an in-room doorway. 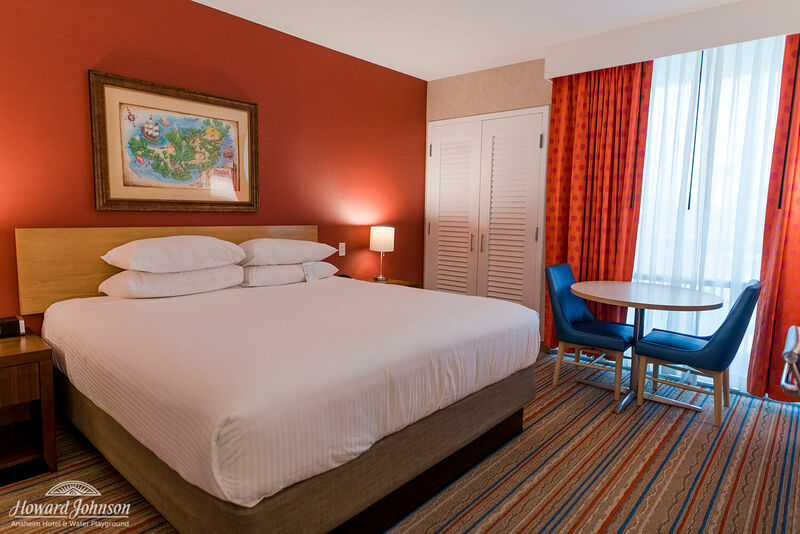 Our Bundles are located in our iconic Building 1, with some of these rooms overlooking our Castaway Cove Water Playground oasis. 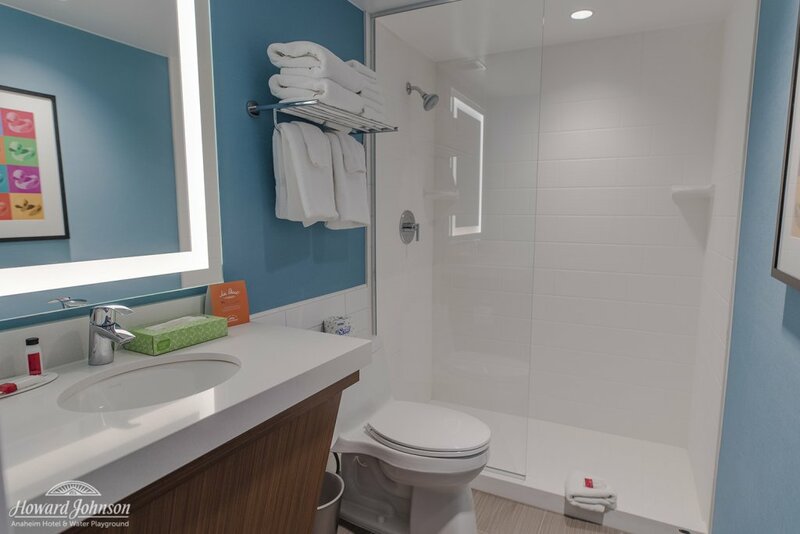 Two Queen/Two Room Bundles feature two of our newly-remodeled Two Queen Rooms, connected by an in-room doorway so the whole family can spread out but easily stay connected at the same time. 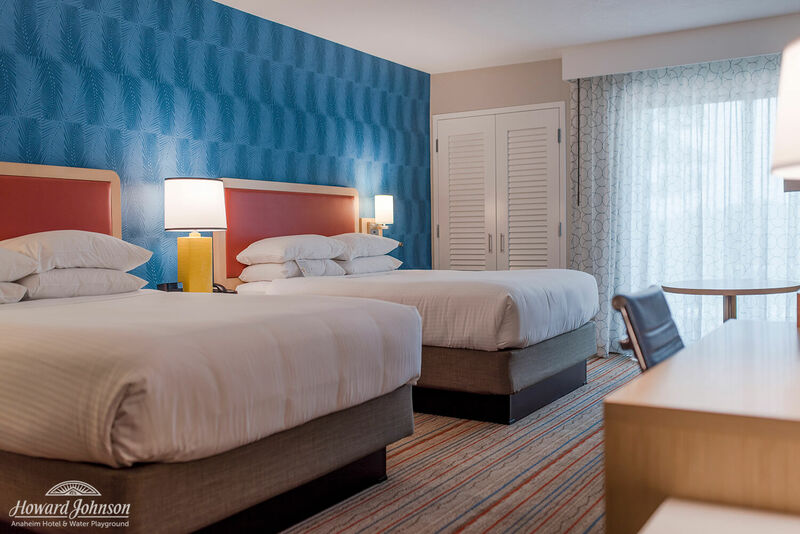 Our Bundles give your family a total of four queen beds, two bathrooms, two mini fridges, and all of our other in-room amenities — spread comfortably over two spacious guest rooms! 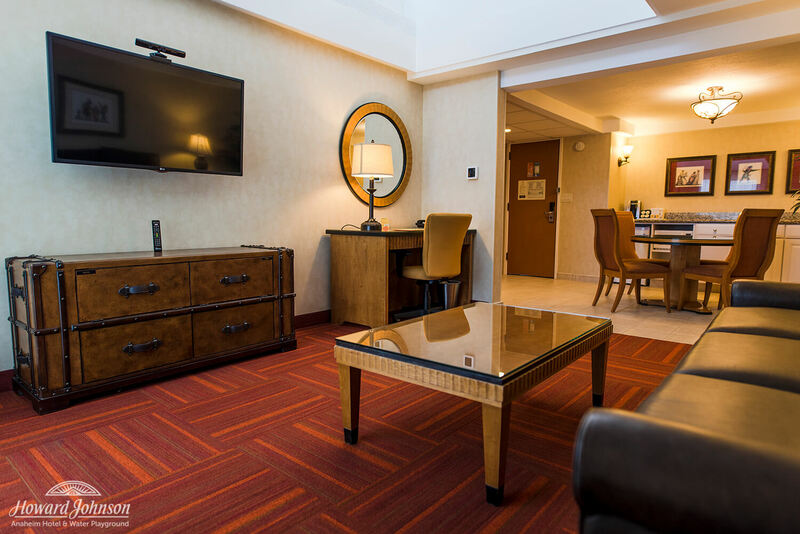 If you’re looking for a more luxurious getaway, our 700-square foot two-room suites are the perfect choice to celebrate a special occasion. 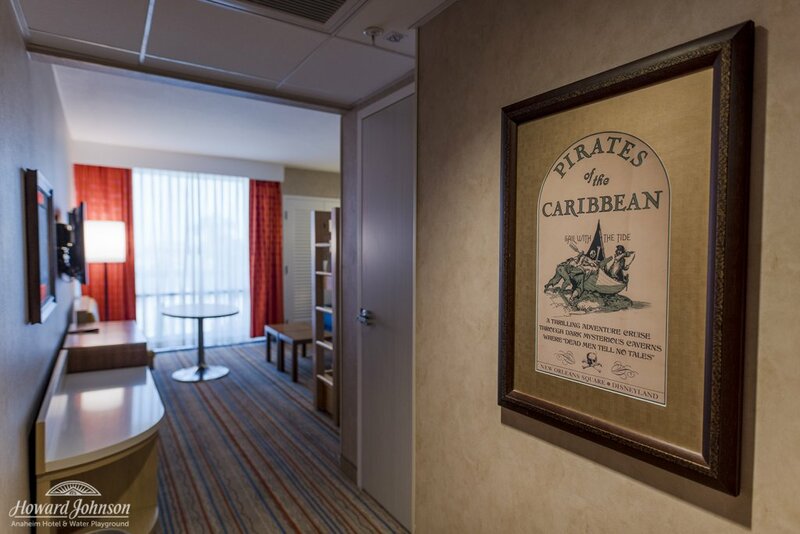 Comfortably sleeping up to six, our swashbuckling pirate-themed Two-Room King Suite features a master bedroom with a king size bed, a living room area with a queen-size sleeper sofa, a spacious bathroom, and a large dining area with a sink, mini fridge, and plenty of counter space. Featuring two balconies overlooking our pirate-themed Castaway Cove Water Playground and serving up stunning panoramic views of Disneyland across the way, you’ll feel like a pirate in coolest crow’s nest ever! Over in Building 2, our Two-Room Queen Suite overlooks our serene Garden Pool and features two of our extra-comfy Dreamscape pillow-top queen beds in one room and a full size sofa sleeper in the living room. 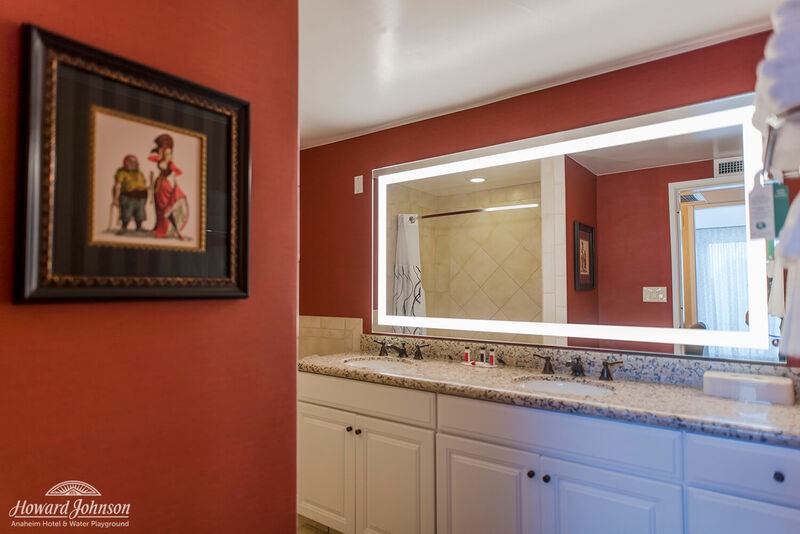 A spacious bathroom and dining area give your family extra comfort during your stay. 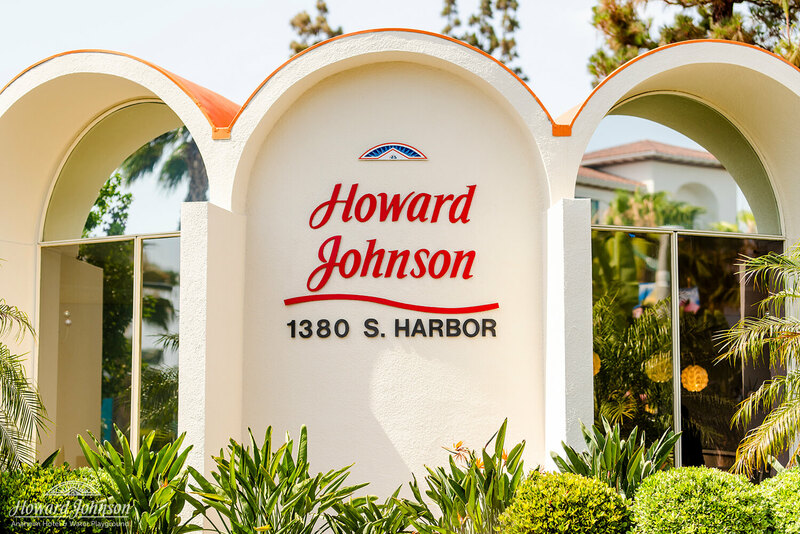 At HoJo, our goal is always to make your stay as perfect as possible. 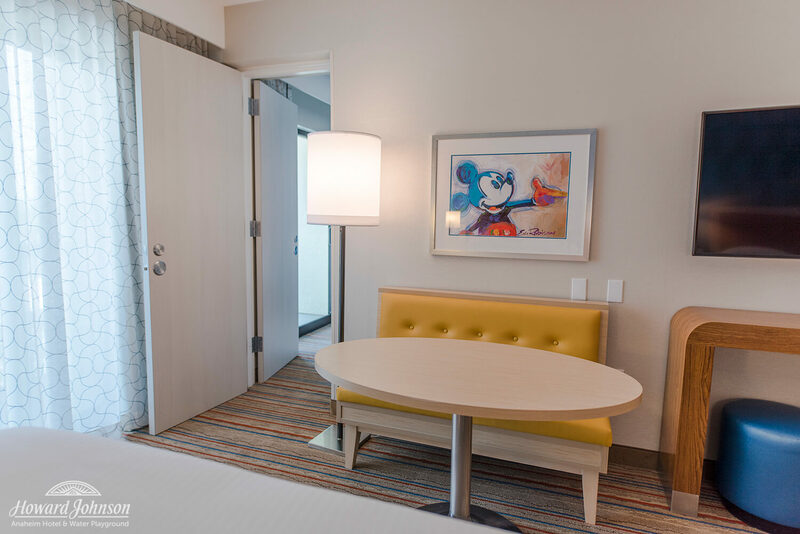 We’re confident one of our many room or suite options will be exactly what your family is looking for to make your Disneyland vacation one that you’ll remember forever. For more information and to book your stay, please call our front desk at (714) 776-6120 or e-mail us at stay@hojoanaheim.com!